in Seoul and later moved to Cheonan , South Chungcheong at age 10. He is the older son of two; his younger brother's name is Kim Jong-jin. From a young age, Yesung expressed an interest in singing. In 1999, he joined a broadcast singing competition and won gold at the Cheonan Singing Competition. 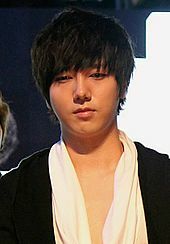 In 2001, Yesung's mother Im Bo-kyung signed him up to audition for SM Entertainment's Starlight Casting System, in which he impressed the judges with his "artistic voice", and signed as trainee under SM Entertainment that same year. His label given him stage name Yesung which is derived from the Korean phrase "예술가의 성대" (lit. meaning: vocal cords of an artist) and can be translated as an "art-like voice". See also: Super Junior and Super Junior K.R.Y. Their debut albumSuperJunior05 (Twins)was released a month later on December 5, 2005 and debuted at #3 on the monthly MIAK K-pop album charts.
. The last air date for the radio show was September 8, 2007.In November 2006, Yesung, along with Super Junior members Ryeowook and Kyuhyun , formed a subgroup, Super Junior-K.R.Y. , a group specializing in R&B ballads. The trio debuted on November 5, 2006 on KBS 'sMusic Bankwith performing Hyena soundtrack called "The One I Love". , a high school comedy starring fellow Super Junior members. He played the school's rock star who gets attacked by a mysterious force.
. The injury aggravated old injuries from the neck and waist and was hospitalised for two days. In June 2008, Yesung became a member of Super Junior-H , releasing their first mini-album titledCooking? Cooking!. He sang ballad track "Love Really Hurts" for the original soundtrack of television dramaTazza, which aired from September 16, to November 25, 2008. In 2009, Yesung made his musical theatre debut inNamhansanseong(lit. South Korean Mountain Fortress), which is based on the novel of the same name by Kim Hoon , which is based on the historical incident of Byeongja Horan , at the Namhansanseong in Gyeonggi-do .But the musical focuses on the lives of common people and their spirit of survival during harsh situations. Yesung played villain "Jung Myung-soo", a servant-turned-interpreter who feels sad from being betrayed by his country, from October 9 to November 4, at the Seongnam Arts Center Opera House.On November 6, he made a surprise appearance on KBS'Music Bankwith label mates SHINee in place of Jonghyun , who was recovering from influenza, in a performance of "Ring Ding Dong". , alongside bandmate Sungmin who also played the historical figure Hong Gildong . It played at the Woori Financial Art Hall at the Olympic Park from February 18, to April 18, 2010.On March 31, 2010, Yesung contributed to the OST of television dramaCinderella's Sister, starring Moon Geun-young and Chun Jung-myung . The song, "It Has To Be You", is a ballad that tells the story about a man who refused to look for another girl, except for the one he loved. On June 4, Yesung performed it for the first time, and his first solo stage, onMusic Bankwhich reached #3 on show's K-Chart. In July 2010, Yesung appeared with bandmate Leeteuk as MC's for MBC'sLove Pursuer. The show presents a Korean celebrity being showered with affection from a secret admirer, with the challenge of guessing who the admirer is. Yesung was himself the subject of admiration in episode 10. During the recording ofDream Team 2on August 21, 2011, he fell from a platform and strained his waist again, but was reported to be a minor injury. On September 4, he became the new MC forMUZIT, a musical talk show alongside K.Will and veteran composer Yoo Young-suk. It showcased various musical talents from the Korean music industry. playing the main role of Sir Galahad. On December 29, 2010, Yesung together with Luna of f(x) , sang the track "Loving You", on part two of the original soundtrack of KBS dramaPresident. Yesung at MAMA in Singapore, November 2011. On January 31, 2011, Yesung's third solo song, from the OST of SBS drama,Paradise Ranch,was released. "Waiting For You" is a ballad that tells the story of a man who is adamant on waiting until the end of the world for his lover to return to him. He performed it for the first time at the Super Junior K.R.Y The 1st Concert in Seoul on February 11.
, while Eunhyuk was away on promotional activities for Super Junior-M 's third EPPerfection.In June, he joined KBS'sImmortal Songs 2where singers render their own versions of old songs from music legends and winners are selected by voting.He lost in the first episode but won the third episode when he sang Boohwal 's song "The More I Love". His second duet with Jang Hyejin, was released on July 14, 2011 throughout Korea's digital charts. "I Am Behind You" is from the albumCooperation Part 1. The song has a fantastic harmony and is mixed with the lyrics of secretly loving someone and wondering if that person could possibly be feeling the same way about them. On July 18, 2011, "For One Day" was released. It is from the OST SBS historical dramaWarrior Baek Dong Soo. The song explores an emotional farewell from a lover. Yesung performed this live for the first time on October 6, 2011 at the K.R.Y Concert in Nanjing . Music BankandShow! Music Coreof Kim Jang-hoon latest single, "Breakups are So Like Me". Heechul is featured in the song and starred in the music video, which was completed the day before he enlisted. On November 11, 2012, Yesung along with his brother Kim Jong-jin officially opened their cafe "Mouse Rabbit Coffee" after their franchise, "Babtols" and "Handel & Gretel". It debuted at number two on the Oricon's daily singles chart. was released. The track was composed by label mate Kangta and where he went on to performe it on SBS's music programInkigayoon February 17. 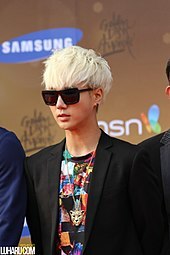 Yesung at 27th Golden Disk Awards Red Carpet on January 2013. During his military service in February 2014, Yesung joined the ballad group SM the Ballad , initially formed by SM Entertainment in 2010. On the group's 2nd album , he had a solo song for the track "Blind", which releasing on Korean and Japanese version sung by Yesung, however didn't participate with the promotions. The trio released Japanese single Japan titled "Join Hands" on August 5, 2015.
which was released on July 16, to celebrate the group's 10th anniversary. from the OST of MBC drama, Splendid Politics was released. In November, Yesung played a role in Korean dramaAwl. Sweet Coffee, part of S.M. Entertainment concert series The AGIT, is set to be held in June 2016. Voice,to air in January 2017. On April 18, 2017 Yesung released his second extended play titledSpring Falling. The album contains six tracks, with the lead single titled "Paper Umbrella". Super Junior-Yesung Special Live "Y's SONG"
Mark Russell (29 April 2014). K-Pop Now! : The Korean Music Revolution. Tuttle Publishing. p. 39. ISBN 978-1-4629-1411-1. "Album Sales of December 2005". Recording Industry Association of Korea (in Korean). p. 1. Archived from the original on February 25, 2006. Retrieved 2007-10-16. "Super Junior Members Complete 24-Hour 'Marathon of Hope'". KBS. Archived from the original on 17 May 2008. Retrieved 26 March 2012. Kim, Jessica (5 November 2009). "Super Junior's Yesung to make appearance for SHINee". Asiae. Retrieved 26 April 2012. Kang, Seunghoon. "SuJu's Yesung chosen for the lead role in "Spamalot"...Third musical challenge". AsiaEconomy. Retrieved 6 April 2012. Choe, MinJi (28 September 2011). "Super Junior Fills in For Heechul for Kim Jang Hoon Duet". enewsWorld. CJ E&M. Retrieved 2012-03-30. Hong, Grace Danbi (22 November 2012). "Super Junior-K.R.Y. to Release First Japanese Single Promise You". enewsWorld. CJ E&M. Retrieved 4 April 2013. Lee, Sun-min (8 March 2013). "Wind Blows features melancholy tracks by Girls' Generation, H.O.T, Super Junior". Korea JoongAng Daily. Archived from the original on 19 June 2013. Retrieved 2013-04-03. Hong, Grace Danbi (25 March 2013). "Super Junior's Yesung to Enlist in the Army". enewsWorld. CJ E&M. Retrieved 4 April 2013. Lee, Sun-min (26 March 2013). "Yesung to begin Army service". Joongang Daily. Archived from the original on 1 July 2013. Retrieved 4 April 2013. Lee, JiYeon (12 April 2013). "Super Junior′s Yesung to Enlist on May 6". enewsWorld. CJ E&M. Retrieved 14 April 2013. Lee, Sun-min (13 April 2013). "Yesung's enlistment date confirmed". Joongang Daily. Archived from the original on 30 June 2013. Retrieved 14 April 2013. "Super Junior–K.R.Y. Successfully Commences Japan Arena Tour in Yokohama". kpopstarz. June 5, 2015. Retrieved August 10, 2015. "Super Junior K.R.Y. will kickstart their Asian tour in Seoul in August". koreaboo. July 18, 2015. Retrieved August 30, 2015. "Super Junior-K.R.Y. Announce New Single 'Join Hands' Due Out August 5". kpopstarz. June 4, 2015. Retrieved August 30, 2015. "Super Junior to Release Special Album 'Devil' on July 16". CJ E&M enewsWorld. July 8, 2015. Retrieved 2015-08-30. "'슈주' 예성, JTBC 새 드라마 '송곳' 출연하나…조율 중 [스포츠투데이]". asiae. 26 July 2015. Retrieved 2015-08-30. SMTOWN_EN. "[Vyrl] SMTOWN_EN : #YESUNG to release his first mini album 'Here I am' on April 19, 0AM (". "Block B win #1 + Performances from April 21st 'M! Countdown'! \allkpop.com". allkpop.com. Retrieved 23 June 2017. "Yesung to Hold His First Solo Concert This Summer - Soompi". www.soompi.com. "Super Junior's Yesung to hold his first solo concert! - allkpop.com". "OCN 측 "예성, '보이스' 출연 확정..장혁·이하나와 호흡" - 스타뉴스". star.mt.co.kr. Retrieved 2016-11-18. Jang, Kyung-Jin (21 January 2010). "When Super Junior meets Hong Gil-dong". 10Asia. Retrieved 27 April 2012.